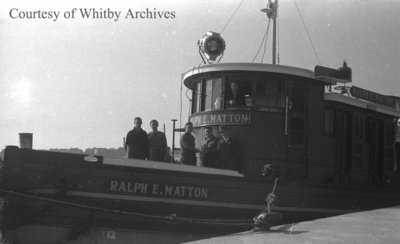 A black and white negative of men aboard the Ralph E. Matton Tugboat in the Whitby Harbour on October 19, 1938. Ralph Matton owned a shipyard, John E. Matton & Sons, with his father in Cohoes, New York. The shipyard closed in 1966. Ralph E. Matton Tug, October 19, 1938, October 19, 1938, Marjorie Ruddy. Whitby Archives A2013_040_732C.